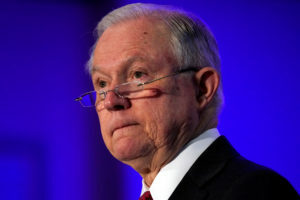 WASHINGTON — Days after President Donald Trump deemed Jeff Sessions “beleaguered” and threatened to fire him last July, members of the president’s inner circle made a desperate case to save the attorney general’s job. The White House chief of staff, Reince Priebus, and the president’s chief strategist, Steve Bannon, pleaded with Trump during a heated Oval Office meeting to keep Sessions, warning that his dismissal would only pour gasoline on the Russia investigation. And, they said, it could alienate those in Trump’s conservative base, supporters enamored with the attorney general’s tough stances on law enforcement and immigration. Priebus and Bannon both were out of their jobs within the month. But Sessions survived, his reprieve delivered by John Kelly as one of his first acts as chief of staff. Ten months later, the Republican campaign to save Sessions has continued and — at least for now — succeeded. In private meetings, public appearances on television and late-night phone calls, Trump’s advisers and allies have done all they can to persuade the president not to fire a Cabinet official he dismisses as disloyal. The effort is one of the few effective Republican attempts to install guardrails around a president who delights in defying advice and breaking the rules. It’s an ongoing effort, though not everyone is convinced the relationship is sustainable for the long term. As recently as this month, Trump lawyer Rudy Giuliani said the president had raised the issue again, wondering aloud if he’d made a mistake in not firing Sessions. And both Giuliani and influential Republican lawmakers have hinted that, once special counsel Robert Mueller’s probe wraps up, Sessions could be in danger again. The campaign to save Sessions hasn’t tempered Trump’s anger at the attorney general’s decision to recuse himself from the Russia probe, an act the president believed birthed the Mueller investigation, which is imperiling his presidency. In a Wednesday tweet, Trump again declared he regretted appointing the former Alabama senator to the job in a familiar, but no less stunning, public rebuke of a sitting Cabinet official. Despite the withering complaints, Trump appears to comprehend the potential consequences of firing Sessions and seems resigned to the idea that he’s stuck with him for the time being, according to nearly a dozen people close to the decision, who spoke on condition of anonymity to discuss private conversations. Trump appears to comprehend the potential consequences of firing Sessions and seems resigned to the idea that he’s stuck with him for the time being. The case that Sessions’ protectors have outlined to Trump time and again largely consists of three components: Firing Sessions, a witness in Mueller’s investigation of obstruction of justice, would add legal peril to his standing in the Russia probe; doing so would anger the president’s political base, which Trump cares deeply about, especially with midterm election looming this fall; and a number of Republican senators would rebel against the treatment of a longtime colleague who was following Justice Department guidelines in his recusal. Senate Judiciary Committee Chairman Chuck Grassley, R-Iowa, has said that he will not schedule a confirmation hearing for another attorney general nominee if Sessions is fired. Giuliani told The Associated Press on Wednesday that Trump has asked him multiple times, before and after the former New York mayor joined the president’s legal team last month, about whether Sessions should have been fired. More recently, Giuliani said Trump has not actively considered firing Sessions but has wondered if he made the right decision in not doing so previously. “And when he asks, ‘Should I have done that?’ I say, ‘No, the way it is now has worked out,'” Giuliani said. Influential conservatives have also heard Trump lash out about Sessions and, though some have sympathy for the concerns, have repeatedly talked him out of doing anything drastic, said one person in touch with both men who spoke on condition of anonymity to discuss private conversations. The person recalled a venting session after a meeting at the White House last fall, when the president aired his frustrations with the attorney general about his recusal. The person expressed sympathy, but argued against firing Sessions. While the recusal remains Sessions’ original sin in Trump’s eyes, the president has also fumed that he sees Sessions as failing to get a handle on immigration and not placing enough emphasis on combating transnational criminal organizations. After being berated by Trump over the recusal decision last spring, Sessions offered his resignation, but the overture was rejected. He is widely viewed as determined to stay in the job because he believes in the president’s agenda, which largely mirrors his own interests, and is reluctant to leave a job for which he gave up a Senate seat. Hours after the president’s attack on Wednesday, Sessions visited the White House for a routine litigation issue, a Justice Department official said. There may be a limit to how long the campaign to save Sessions can hold on. Giuliani on Wednesday only offered assurances Trump would not fire Sessions during the Mueller investigation, because of the “distraction” it would cause. And a number of Republican senators who have supported Sessions have indicated in recent days that they are warming to Trump’s complaints. Associated Press writers Chad Day and Jill Colvin in Washington contributed to this report.